For many, twisted or crooked teeth can be the result of a number of different factors. In some circumstances, some people’s mouths can simply be too small for their teeth; this overcrowds the mouth and results in the shifting of teeth. In other cases, the lower and upper jaw aren’t the same size, which can result in either an under or overbite. However, the most common reason for crooked teeth is simply just genetics. Similar to the colour of your eyes and the colour of your hair, twisted teeth can be a trait that is inherited from your parents. While it may be immediately obvious to you if your teeth are crooked, your dentist can assist you in determining whether you require treatment. To begin with, the dhealth Dentistry team will examine you for tell-tale signs, such as the crooked alignment of teeth, abnormal facial appearance, discomfort or difficulty when biting or chewing or a speech impairment. If one of these signs is recognised, x-rays will most likely be taken of your face and teeth, determining what type of treatment may be required. We may also take impressions of your teeth, having you bite on a soft material. Following a diagnosis, the best orthodontic treatment program will be discussed. For some people, a method as simple as a retainer can be used, fixing and stabilising twisted teeth. However, others may need further treatment to correct crooked teeth. 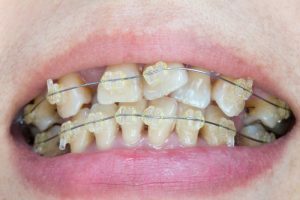 In most cases, braces or invisalign will be the necessary course of treatment to correct this issue, however in some extreme circumstances, an operation may be necessary.